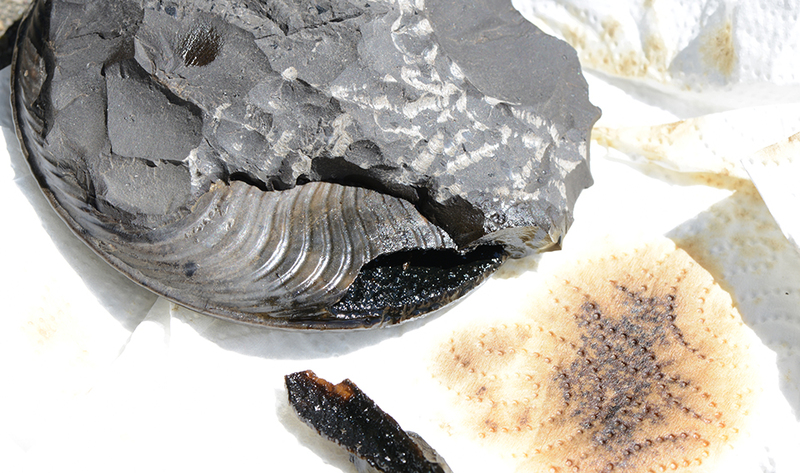 The Cleveland ammonite – a question of ancestry and an unwanted oil find ! 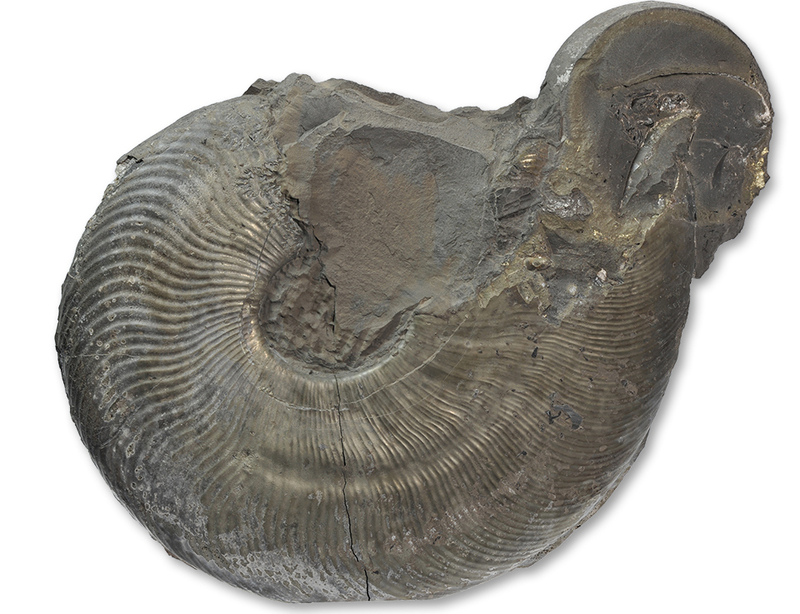 In his 1992 monograph “The Ammonite family Hildoceratidea in the Lower Jurassic of Britain”, HOWARTH intoduced the new genus Cleviceras, named after the northern England area Cleveland (which by the way literally means “cliff land” (Wikipedia)). 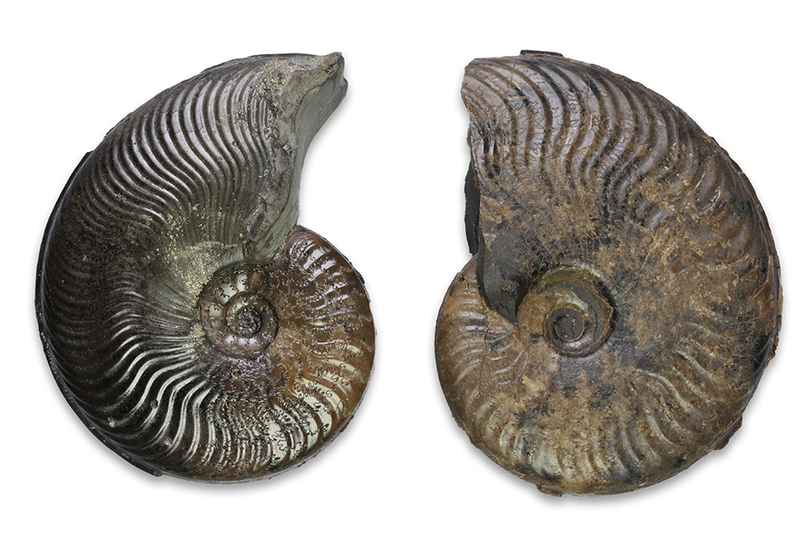 It was not that this was an ammonite genus that was newly established because new specimen had been found, it was done to recognize that an understanding about the phylogeny, the history of the evolution of that genus, had been reached, that made it necessary to separate it from the previous genus Harpoceras. Previously, Cleviceras had been under the genus Harpoceras mainly for morphological reasons : The sickle-shaped style of ribbing is very similar to Harpoceras falciferum, the type species of Harpoceras, allthough there are differences in detail. 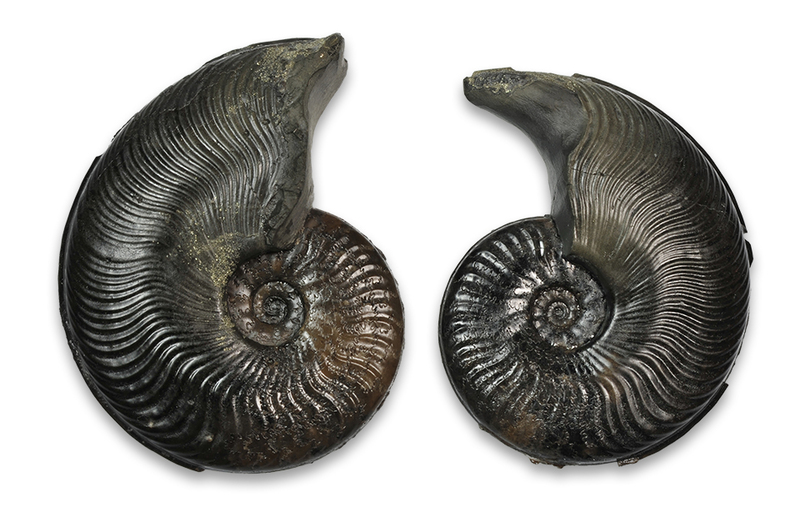 In short words : Cleviceras is no longer considered to be the ancestor of Harpoceras falciferum, so it needs to be a different genus. Another solution for this problem would be to put the Cleviceras species under Eleganticeras, which was put forward by GABILLY in 1976 and BÉCAUD in 2006. Both exhibit a strong dimorphism, the microconch is considerably smaller than the macroconch, with an adult macroconch reaching up to 4 to 5 times the size of an adult microconch at maximum observed sizes. Largest macroconches can get close to 200 mm in size, while largest microconches have been found between 50 and 60 mm. are smaller than the previous chambers, i.e. the sutures are closer to each other. Approximation of sutures before the body chamber, indicating a mature shell, in this case a microconch of Cleviceras exaratum. The effect is especially visible at the umbilical edge. 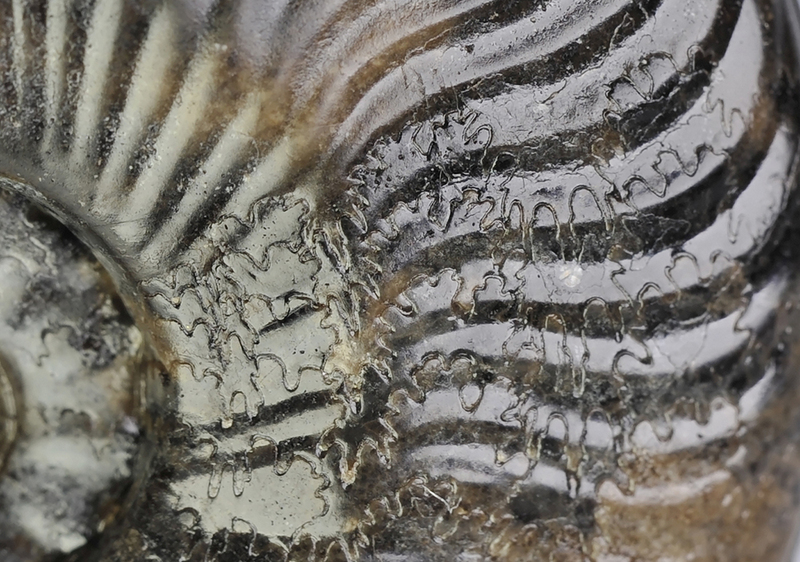 Cleviceras exaratum, body chamber of a macroconch, 18 cm. There is a pathology on the last 1/4 of the whorl. 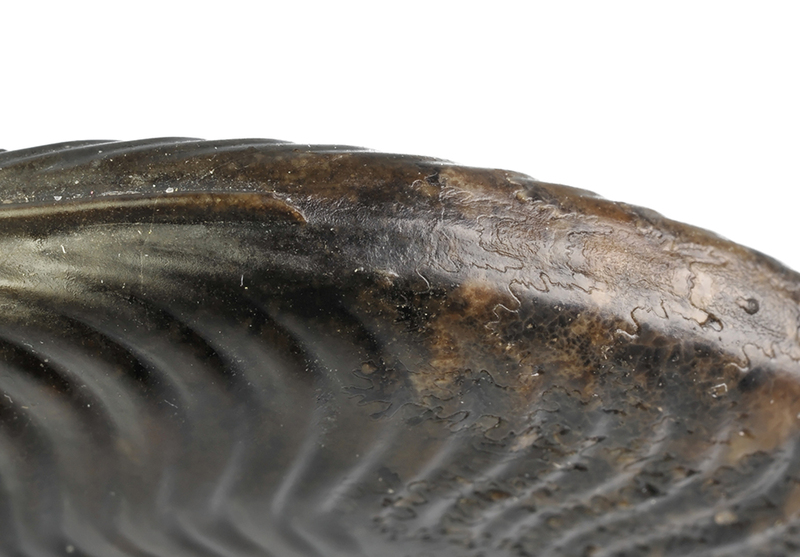 Both species have a strong hollow keel, which is floored on the phragmocone, but not floored on body chamber, which easily explains why the keel most easily breaks off on the chambered part of the shell : this additional bit of shell creates a predetermined breaking point between the phragmocone and the keel. Keel of Cleviceras exaratum : The keel has an extra floor on the chambered part of the shell, and the calcite keel easily gets lost during preparation. Also visible here : The last chamber before the body chamber is smaller, indicating an adult shell (in this case microconch). Comparison between Cleviceras exaratum (left, mature microconch) and Cleviceras elegans (partial macroconch), both 5 cm. The umbilical walls of Cleviceras exaratum are vertical or even undercut, while the umbilical walls of Cleviceras elegans are beveled. Comparison of Cleviceras elegans (left) with beveled umbilical walls and Cleviceras exaratum (right) with undercut umbilical walls. I could literally pour about 20 ml of liquid oil out of this ammonite – what you see on this picture on the kitchen towel is just what dribbled out afterwards !